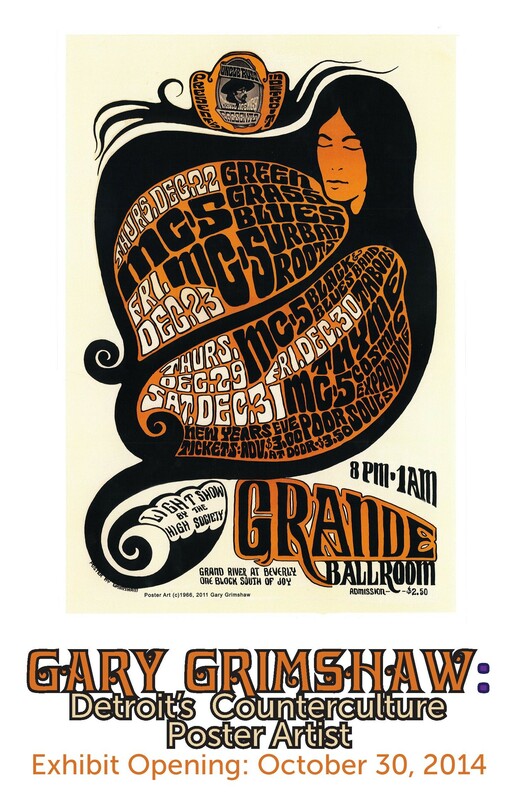 Join us for a night of psychedelic art and music as we showcase the iconic rock n’ roll posters of Detroit artist, Gary Grimshaw (1946-2014). The night will also include a screening of the award-winning documentary, Louder than Love, highlighting the Grande Ballroom at the height of its popularity in the late 60s. Beer generously provided by Atwater Brewery. Food will be available for purchase. Reproductions of Gary Grimshaw’s most iconic posters will be available for purchase. Your support makes events like this possible and your donations are always appreciated! Please confirm your attendance with Nova Zorok at 313.833.1262 or novaz@detroithistorical.org. If you miss the film, come back to the Detroit Historical Museum Sunday, November 2 at 3 p.m. to see it again! PLEASE NOTE: DTE utility work at Cass and Kirby is scheduled for Monday, October 27, 2014 at 7 a.m. – Thursday, November 27, 2014 at 7 a.m.
Kirby St. West of Woodward Ave.
 DTE work will be taking place at the intersection of Woodward Ave. at Kirby St. – prohibiting vehicular traffic to turn West of Woodward Ave. onto Kirby St.
Kirby St. East of Woodward Ave.
For questions about DTE utility work, please call 1 800-477-4747. From the East: Follow I-94 to I-75 South to Mack Avenue exit. Turn right on Mack Avenue to Woodward Avenue. Make a right (northbound) onto Woodward. Take Woodward Avenue to Warren. Turn left on Warren, followed by a right onto Cass Avenue and right onto Kirby Street to the Detroit Historical Museum. From the West: Follow I-94 to M-10 (the Lodge). Exit M-10 South to Forest Avenue. Follow Forest Avenue east to Cass Avenue (through three signaled intersections). Turn left (northbound) onto Cass Avenue. Follow Cass north to Kirby Street (approx. 5 blocks). Turn right at Kirby Street to the Detroit Historical Museum. Woodward Avenue remains open for traffic but travel lanes are reduced between Baltimore Street and Warren Avenue. Please note that both the I-94 East and Westbound exits for Woodward Avenue/John R are closed due to Woodward bridge construction for the M-1 Streetcar project. For M-1 RAIL construction updates, please visit www.m-1rail.com and sign up for our M-1 RAIL Weekly Update e-newsletter and text alerts. Parking: Parking is $6 in the adjacent Museum lot on Kirby, while available.